(Matthews, North Carolina) October 25, 2016- CEM Corporation, a leading supplier of process control solutions, is pleased to introduce the all new ORACLE Fat Analyzer based on a very recent breakthrough in NMR technology. 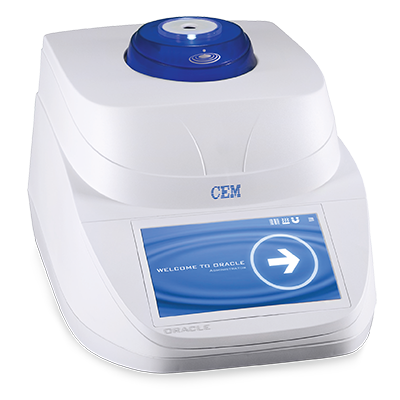 ORACLE is the first ever rapid fat analyzer that requires absolutely no method development and can analyze fat in any unknown food sample with reference chemistry accuracy and exceptional repeatability. The food industry has traditionally relied on reference wet chemical methods as the primary standard for fat analysis. These long, antiquated, and hazardous processes suffer from repeatability challenges and take several hours to complete. This has led to the use of rapid fat analyzers which are calibrated against reference wet chemistry. While faster, these systems often require extensive method development as results are affected by sample composition. Existing NMR techniques have partially reduced method development by the ability to directly analyze an entire sample and not be effected by surface properties. However, all current technologies still require some form of method development and correlation to reference chemistry. The instrument comes in two configurations, rapid and high-throughput. The rapid system is paired with the newly released SMART 6 Moisture/Solids Analyzer allowing for moisture and fat analysis in less than 5 minutes. The high-throughput option incorporates a robotic system allowing for the unattended processing of up to 100 samples.